You may know how you want to improve your health facility and where you need to make changes. But sometimes it is not so easy to decide where to start, and what your investment priorities should be. This is where SafeCare can help. SafeCare is an internationally-accredited quality assessment and improvement program. SafeCare begins with a thorough assessment of your clinic to assess its performance in key clinical and managerial areas. These include the availability and use of standard operating procedures and equipment, the status of the infrastructure, and the qualifications and availability of staff. After each assessment, the facility is graded levels 1-5 and awarded a certificate of improvement. Importantly, the assessment also enables a Quality Improvement Plan (QIP) to be drawn up that identifies precisely what needs to be improved. The QIP usually covers around 60 actions to be implemented over one year. Many of these actions require little or no investment, such as writing job descriptions. You can also access the SafeCare library where there are hundreds of template documents and manuals to help you implement these non-investment actions. Other activities do require investment, such as a new information management system, new medical equipment, or infrastructure expansion. Having been identified in the QIP, these investments can be included in your loan application for financing. How can SafeCare benefit your healthcare facility? 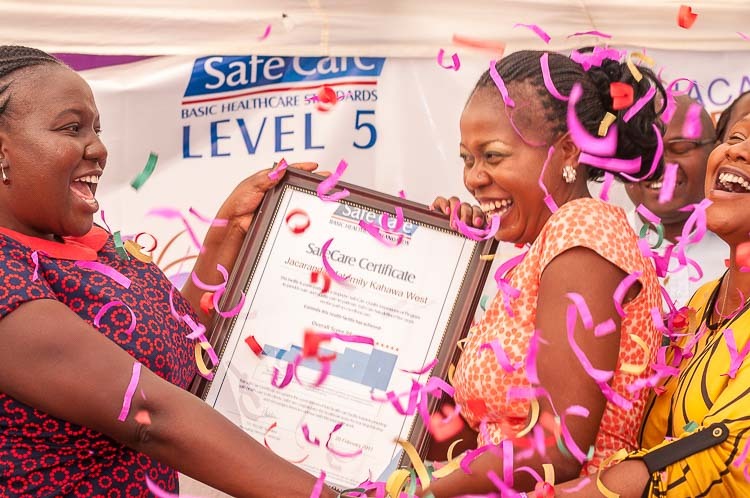 By helping healthcare providers to implement a structured approach to quality improvement, and set informed investment priorities, SafeCare gives MCF and its financial partners the comfort that loans will be used in the right way and address the right areas. This can lead to shorter lead times for loan applications and lower interest rates. Once your facility has implemented the actions identified in its QIP, it will receive a follow-up SafeCare assessment and another QIP will be drawn up to advance the facility to the next level. When the facility has successfully moved through the five levels of SafeCare certificates, you could opt for full accreditation from the Council for Health Service Accreditation of Southern Africa (COHSASA). “Jacaranda embarked on the SafeCare journey to increase visibility and demand for better quality in health service delivery. Proving that at the community level one can lead and deliver services that positively transform the community. Want to know more about SafeCare?